Is it time to go beyond the rim? It seems as if we have reached the point, after nearly 16 years, that it may be time for B5TV.com to retire. Our conversation here has dwindled to less than a trickle and without a B5 project on the horizon, there isn't much reason, other than nostalgia, to keep this place running. I have been chatting with our board owner Antony about what to do with this community, or the remnants of it. Occasionally, some of the old-timers check in and we acquire some new members, but it is clearly well past its prime. I would like to open this dialogue up to whomever is still reading the forums to get some feedback before pulling the plug. Re: Is it time to go beyond the rim? I would miss it if it were gone. There was an announcement the other day that the forums at IMDb would be terminated as of Feb. 19 and somebody mentioned this place as an alternative. Don't know if that might result in new members as the deadline draws nearer? I would miss it too. Don't pull the plug just yet! I will also miss this place. I check in from time to time, but rarely see any new posts outside of the Babbleon members lounge. It seems I have returned, by pure chance, at an opportune time. On the other hand, I'm re-watching the show with my beloved, and marveling at its continued relevance. With some stories, there's still more to talk about, even many years after the last tale is told. I think B5 will stand that test of time, as long as there are some of us who remember it and occasionally lead others to it. I'd love to relay my partner's feedback/theories to my fellow fans -- Adrian's quite a shrewd guesser sometimes, and other times comes up with wildly-off-yet-still-logical theories, too. It's fun to see the story through fresh eyes. Let me say this. 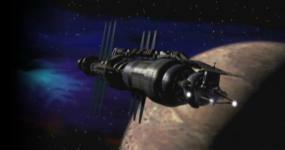 If B5TV is to go beyond the rim, let us have a farewell tour first, as Sheridan did. Pick a date and announce it. Put out an all-call. Give us time to reconvene and reminisce for a bit, to catch up and renew acquaintances. Then, at the appointed hour, let the forum fade into the black. ...Or, if the catching-up was sufficiently fruitful, we could give a stay of execution. But I would expect the black. I have no idea of the costs involved but would it be feasible to just shut the site to any further comments but keep it up as an archive? There are some *really* good conversations here. My biggest concern over this place closing down is losing touch with the members I've met here over the years. Many don't stop in often or at all any more, but it would be nice to know there would still be a way to reconnect with them somehow if they did try and come back. Some old familiar faces do still pop in from time to time. I know there is little going on in the way of the world of B5 anymore but it's still a nice place to come and look up prior discussions and opinions on the show. As I've expressed, I'd love for this place to stay open, but I certainly understand if we are in our final days. As KoshFan stated, if it does close down a little grace period and time to say goodbye would be nice. "I have often been accused of putting my foot in my mouth, but I will never put my hand in your pockets." If this board is to go the way of the Dodo, can I suggest that anyone still wishing to discuss B5 or the wider work of JMS, sign up at the JMS News forums. It's a small community now, but we do still manage some nice discussions. We've also been discussing Sense8 and other shows. Please head over there if you need another place to hang out and talk B5. Hello, Markas and all First Ones. I only check in here once or twice a year to see if anything new has been posted, or whenever one of the cast crosses beyond the rim. We can always start a private/members only page on Facebook. That seems to be where everyone hangs out these days. It will be a sad day when Antony turns off the lights at B5TV, though. And I agree with KoshFan. A farewell get-together would be appropriate. "To be ignorant of what occurred before you were born is to remain always a child." "Why don't you say something righteous and hopeful for a change?" I can't say how much cost and trouble the site is to keep up at this point. But I do know one thing: it is not a hazard to navigation. "If we crave some cosmic purpose, then let us find ourselves a worthy goal."